It’s been a very busy time chez Calash, with many changes underway and to come. It’s hard to keep up with all the writing I’m doing everywhere, but eventually I’ll be back on topics of authenticity, standards, and whimsical Wednesdays. This week, though, is all about checks. (Most weeks are, in some way, aren’t they?) Not paychecks, silly: linen checks. We are headed out to Eastfield Village Friday afternoon where Mr Hiwell and the Young Mr will join in the 1833 militia muster, and Mr JS and I will occupy a house as a shop/tailoring business/punch-making and cooking establishment of one kind or another. Mr Hiwell has been warned to expect a diet unlike his norm, and since his roundabout is white, we will quickly know if he is smuggling Oreos and barbeque sauce. 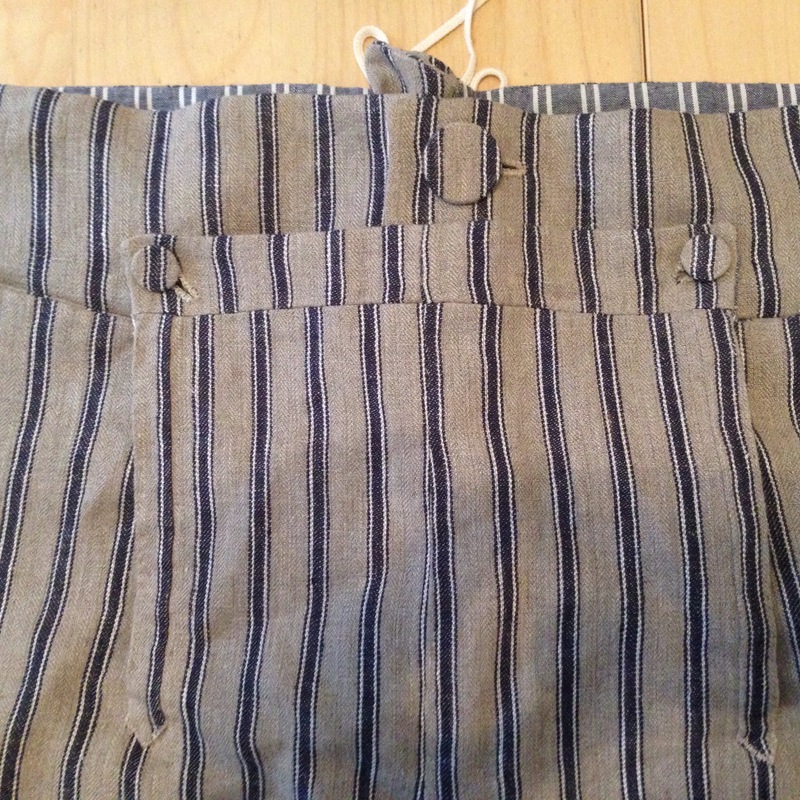 For the Young Mr, I have been making trousers. Yes, I do like things to line up. I wasn’t even paying that much attention when I cut these, but apparently that was was enough. He’s also got a roundabout in the works, which I must focus on more closely to finish. This is patterned from an original in Henry Cooke’s collection, but… Mr. Cooke and I, on a very sticky Tuesday afternoon, did not have the Young Mr at hand to measure again. The original was too small: that we knew. What we did not know was that the boy had taken on a man’s shape– or, as a friend says, “he’s dude-shaped now!”–and the additions we made were not enough, except (barely) to the sleeves. Oh, well. There was just enough to make it all work, and after some trials I realized it needed a lining. What kind of lining? 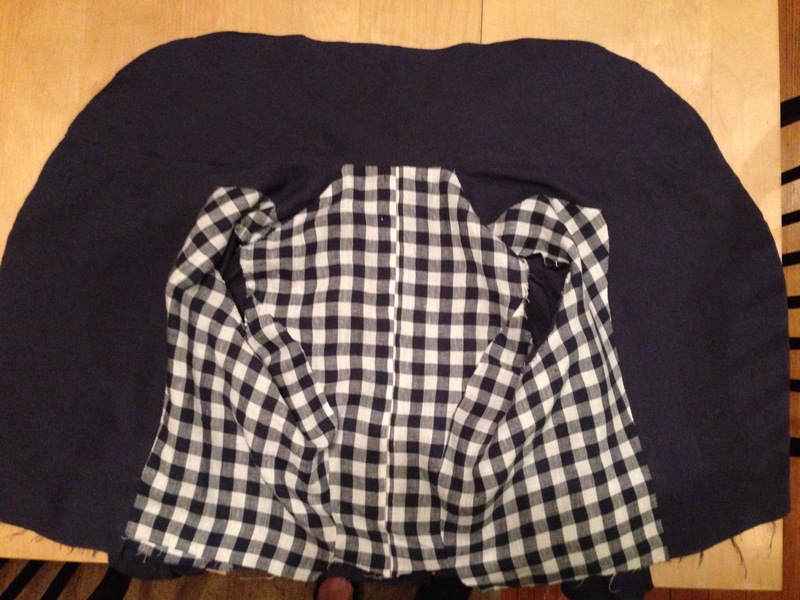 A checked lining, of course! It seems okay, but these collars are strange to me. Well, at least he will be clad. Let you think I’m sewing only for the lad, I am in fact working on a gown for myself. There’s a hopeful yard or so of another check’d linen from the stickiest fabric store on 39th Street lurking, but I do not think that apron will happen this week. Perhaps John Brown’s housekeeper will finish it someday. At least there are already gowns and aprons ready-made that can travel with me. Someday soon I’d like to finish my new stays… winter will come soon enough, and more sewing then. Dang woman! Those britches look mighty fine! Know what you mean about growing males. My Mr has decided to grow, at 60, and my old patterns can’t be jumped into without some careful measuring. Mr Frock Coat did get made without my pulling an all nighter but there was some pattern wrangling for sure!